Black Monukka Seedless - Medium reddish-purple, seedless berries. Very hardy and sweet. Fruits in large, loose clusters. Ripens early mid-season. (European/cane or spur). Buffalo - Blue slipskin, very sweet grape for wine, juice or eating fresh. An excellent mid- season Concord type grape. Very hardy with good cold tolerance. Once a primary New York wine grape. Campbell's Early - Concord-type. Grows where climate is too cool for Concord. Ripens early. (American/cane). Concord - Very hardy, productive, blue-black grapes. Berries are medium to large with sweet flavor. Best of the blue-black grapes. Ripens mid-season. (American/cane). Concord Seedless - Same berry as Concord except smaller and not as robust a taste, not as vigorous a vine ​(image). Flame Seedless - Seedless, red skin. Medium size with firm, crisp flesh and sweet flavor. Ripens early. Very productive. (European/cane). Himrod Seedless - Yellow, medium-size berries. Slightly hardier than Interlaken. Ripens very early. (American/cane) (image). Interlaken - Very hardy, golden-yellow, seedless, medium berries. Crisp and firm with excellent flavor. Ripens a few days before Himrod. Lady Finger (Olivette Blanche) - Green berries are long and slender. Grow in large, tight, coneshaped clusters. Matures late to mid-season. (European/cane). Muscat (of Alexandria) - Large, roundish berries. Dull green, seeded with moderately tough skin. Strongly aromatic, sweet musky flavor. (European/spur). Niagara - Strong, foxy flavored greenish-white berries. Vigorous and hardy, attractive vine. Ripens a few days before Concord. Good for dessert and wine. (American/cane). Perlette - Medium berries in large, translucent yellow clusters. Distinctive flavor. Ripens quite early. Needs less heat than Thompson. (European spur). Ribier - Large round black grape. Seeded. Mild flavor. (European 1 cane). 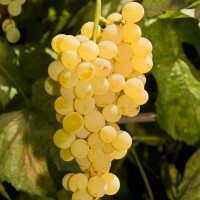 Thompson Seedless - White seedless grape seen in fruit markets everywhere. Ripens early to mid-season. (European/cane). Tokay - Large, oval, brilliant red to dark red berries. 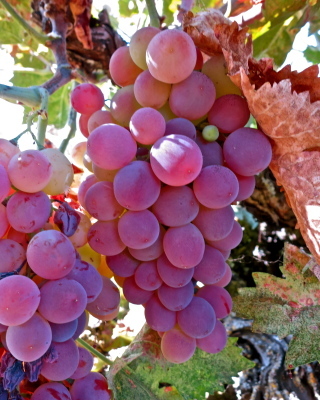 Crisp texture with distinctive wine-like flavor. Ripens late mid-season. (European/spur) (image)​.